The International Society of Bible Collectors (ISBC), is an organization of people who own, use, study or display any number of Bibles. Its purpose, as stated in the Society’s quarterly journal, Bible Review Journal, is to exchange information and encourage interaction among all those interested in discoveries and developments relating to the background and history of all Bible versions, including their translation, publication, preservation, display and distribution. 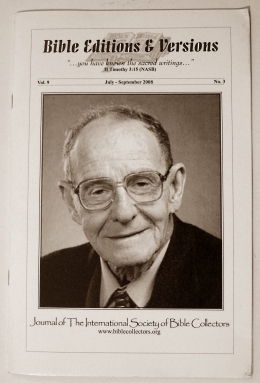 ISBC was founded in 1964 by Arnold Ehlert (1909-1998), who served as it’s first president and editor of the Society’s journal, then called The Bible Collector. Its members share a wide range of interests in the Bible, some acquire Bibles for their value in preparing lessons, classes, sermons or study. Others collect Bibles for lectures on the Biblical text or various aspects of Bible translation or preservation. Still others obtain various Bibles for the personal and spiritual insights they derive from a comparative study of the different translations. Members, who do textual research in translations, versions and editions (even in foreign languages), may not even consider themselves collectors, they just love the Bible for its meaningful message and its powerful influence! Membership in the ISBC consists of people from all religious denominations and fellowships including Bible students, ministers, Bible college and seminary professors and librarians, theological students, translators, missionaries, authors and Bible historians. But many members are simply avid Bible readers who find their reading and understanding of Scripture measurably enhanced by acquiring and consulting a variety of versions. We invite everyone to become a member, whatever their taste or level of interest in the Bible may be and come and learn about the most important book ever written – The Bible!